Edraw Mind Map is an excellent marketing strategy tool for managers, which helps an organization to concentrate its limited resources on the greatest opportunities to increase sales and achieve a sustainable competitive advantage. Here is a marketing strategy example, showing the effective presentation of market dominance strategies, growth strategies, innovation strategies and generic strategy framework. Marketing strategy serves as the basic underpinning of marketing plans designed to fill market needs and reach marketing objectives. With the marketing strategy mind map, it is easy to show the basic structure of a marketing plan. 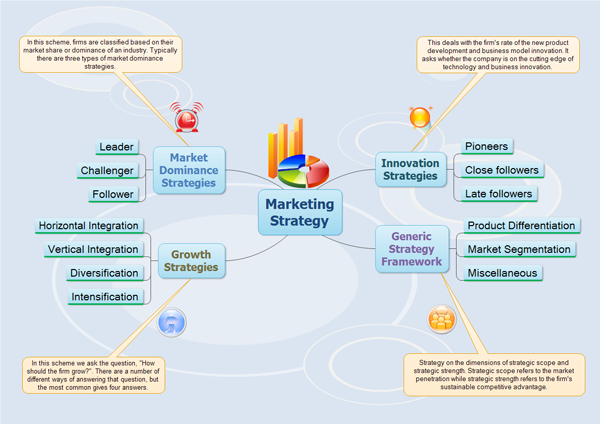 The marketing strategy mind map can be used to develop marketing strategy for a brand. Remember that you can export the Mind Map to text format or MS Word, PDF document if you want to create a traditional text-based marketing strategy. Click here to free download Mind Map Freeware and view the examples. After that, you can use the built-in templates to create and present your decision in minutes.